“Break Away” now available @ the FiXT Store! 07.17.2009 by chris in - News, - Store / Merch | Comments Off on “Break Away” now available @ the FiXT Store! I am excited to announce that “Break Away” is now available at the FiXT Store as a downloadable MP3 album! You can get directly to the STREAK page by clicking here: www.fixtstore.com/category/334/Streak. Don’t forget you can get all for our mech and audio directly from us in the STORE section, but at least this gives you another option. FiXT is owned and operated by Klayton of Celldweller. FiXT is an entrepreneurial venture born from Klayton’s desire to create a network of independent artists and act as a vehicle to bring them together releasing music, clothing and visual art. Other artists available at the FiXT store include Celldweller, Left Spine Down, Cyanotic, Halo In Reverse, Godhead & many, many others. Mrs. Streak Models The New Babydoll Tshirts! 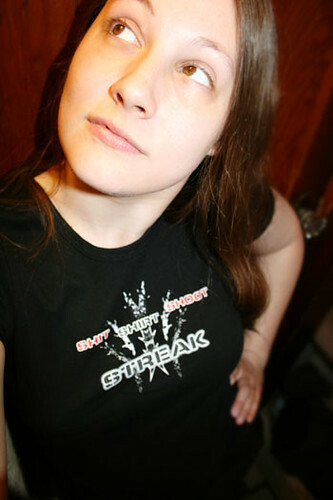 04.27.2009 by chris in - News, - Store / Merch | Comments Off on Mrs. Streak Models The New Babydoll Tshirts! 01.17.2009 by chris in - News, - Store / Merch | Comments Off on Digital tracks now available! Digital tracks of “Break Away” are now available for sale! Tracks are just $0.99 each, or only $9.99 for the whole CD! 12.26.2008 by chris in - News, - Store / Merch | Comments Off on New MEAT Stickers! Artwork by our new friend Bill Castagna! You can now purchase “Break Away” at CDBaby.com, just visit: cdbaby.com/cd/streak. But don’t forget, you can still get the CD as well as all our merch at the Streak Store: www.streakband.net/store.html.